A thick crusted and golden crumbed durum wheat bread from Puglia which makes the best bruschetta. Toasting bread perfect for bruschetta.Our authentic Italian bread has a golden crumb and a slightly chewy texture. It is made to a traditional Puglian recipe using durum wheat milled in southern Italy. Pane Pugliese is a delicious toasting bread. 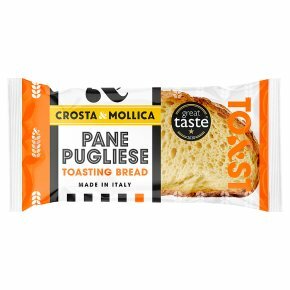 For the best, authentic bruschetta, toast and top with your favourite ingredients or serve at breakfast with butter and Crosta & Mollica conserves.